For most of us, the Blue-Black color of PV solar panels is a given. When we see panels in that color with the outlines of the PV cells, most of us instantly recognize them. When we read or hear the words "solar panels", we instantly think of large blue-black rectangles. That may all change when CSEM introduces white (and colored) solar panels. Traditionally, PV solar panels are a blue-black color. This is due, in part, to the manufacturing process, and also because solar panels need to absorb as much energy from the sun as possible. The more photons a PV cell can absorb, the more electricity it can produce. As most of us learned at school, dark blue/black absorbs a lot (that's why dark clothing makes us feel warmer than light colored clothing). While it is currently possible to make solar panels in a variety of colors, these solar panels just don't perform as efficiently as the blue-black panels. 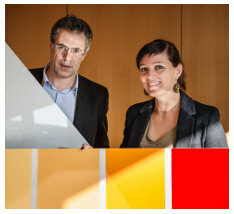 CSEM, a Swiss company, thinks they may have found a solution that will allow colored solar panels to be any color and also hide the PV cells at the same time. Using nano-technology, CSEM is able to create a colored film that can be placed on top of standard solar modules. This film allows infrared light to pass through it to reach the PV cells while visible light is reflected away. The outcome is that the PV cells still generate electricity, but they don't have to look ugly anymore. Although the film can be made in many colors, CSEM is specifically publicizing white. The ability to cover solar panels with a white skin allows architects to blend them into buildings in aesthetically pleasing ways that were not possible previously. As a bonus, the white covering allows the panels to operate cooler (solar panels lose efficiency as they heat up from the sun's rays). By the same token, a building covered by white solar panels may absorb less heat into the interior and save money on air conditioning. While buildings are a large market for colored solar panels, there are many other devices that may benefit. For example, electric cars could implement solar panels on the roof, trunk and hood and still maintain the overall color of the car. Laptops and other electronics could include solar panels without the cases looking like a traditional PV cell. Reportedly, the cost to produce colored cells is reasonable and the technology can be applied on an existing PV module or integrated into a new module during assembly, either on a flat or curved surface.